Take projection out of the boardrooms and put it literally in the palm of your hand with the Cinemin Swivel Multimedia Pico Projector by WowWee. This pocket-size projector features Texas Instruments' DLP projection technology and a unique 90-degree hinge that allows you to project onto virtually any surface. Use it to connect to a wide variety of handheld devices--such as the iPod, iPhone, and Flip Video--so that you can project your videos, photos, and more with anyone, at any time. 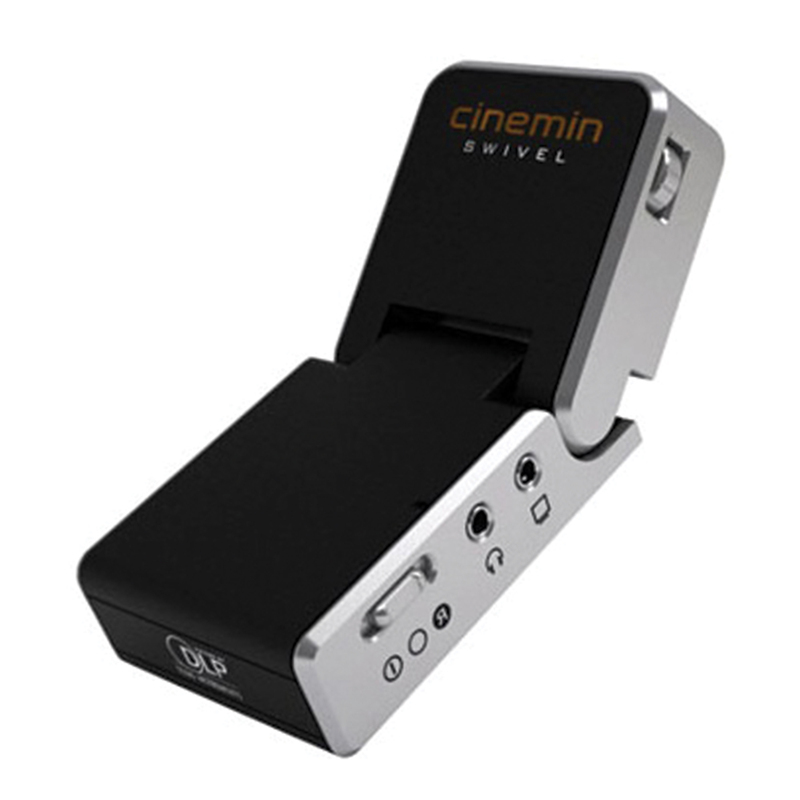 The Cinemin Swivel can be used with your favorite portable media players, including the iPod, iPhone, Flip Video, PSP, digital cameras, portable DVD players, and smartphones with video-out functionality. Not for use with desktop, laptop, or netbook computers. Just connect your device to the Swivels' easy-to-access AV-in jack, and you're ready to project. And with its unique, mid-body 90-degree hinge, the Swivel can project on any surface you can imagine, such as the ceiling, walls, and floor, without a tripod or prop. Featuring Texas Instruments' DLP projection technology, the Cinemin Swivel produces remarkably clear, high contrast pictures with a resolution of 480 x 320 (HVGA). In a dimly lit environment, the Swivel can project a crisp 60-inch image from over eight feet away, or from the floor to the ceiling in a typical room. And unlike most other handheld projectors with battery spans of only 60-90 minutes, the Swivel has a rechargeable battery that lasts over two hours--so you'll never have to worry about your movie or slide show being cut short. The Swivel also includes an AC adapter, giving you the option of running it off any standard electrical outlet. The Swivel boasts a one-of-a-kind, stylish 90-degree hinge that makes it easy to project onto the floor, walls, or ceiling without having to use a prop or a tripod. The handheld projector also includes a built-in speaker with adjustable volume and a headphone jack, allowing you to connect your own portable speakers for when you need to crank the volume. Lightweight and compact, the Swivel is perfect for traveling. And because it comes with a stylish, padded carrying case and includes four power adapters for North America, the UK, Europe, and Australia--the Swivel is ideal for your next globetrotting excursion. By taking projection technology out of boardrooms and literally into the palm of your hand, the Cinemin Swivel lets you enjoy your multimedia collection virtually anywhere, with anyone.